Auf den ersten Blick wirkt das Bild sehr skurril. Im Hintergrund sieht man ein brennendes Gebäude, während im Vordergrund ein Feuerwehrmann Kürbisse zu kaufen scheint. 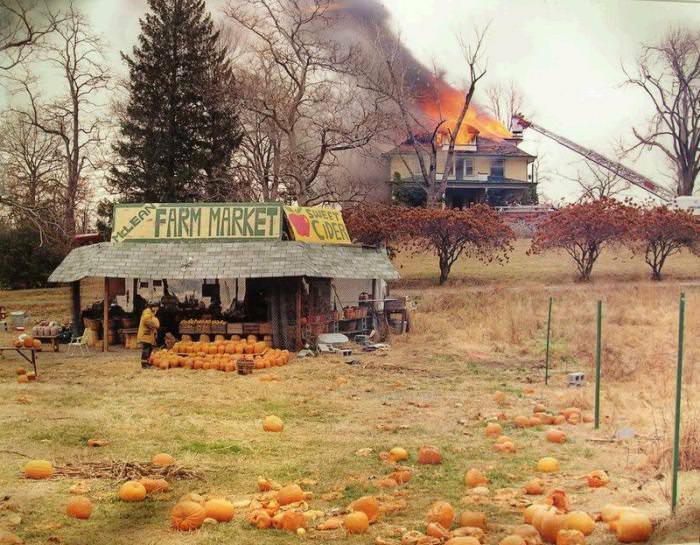 Das Foto mit der knappen Unterschrift “Joel Sternfeld; McLean, Virginia; December 1978” hat bereits alle möglichen Kontroversen ausgelöst. Genauere Informationen zu dem Bild hat Sternfeld aber erst 2004 in einem Interview mit The Guardian preisgegeben. Photography has always been capable of manipulation. Even more subtle and more invidious is the fact that any time you put a frame to the world, it’s an interpretation. I could get my camera and point it at two people and not point it at the homeless third person to the right of the frame, or not include the murder that’s going on to the left of the frame. You take 35 degrees out of 360 degrees and call it a photo. There’s an infinite number of ways you can do this: photographs have always been authored.